The Monthly Magazine of the Galilean Fellowship / Magazine of Aquarian Soulcraft / Weekly News Comment. Indianapolis, IN. Publisher: Galilean Fellowship / Fellowship Press. Editor: William Dudley Pelley (1890-1965), editor and publisher. 1/1, September 1941-March 2, 1942. 32-16 pp., $3.00 a year. The journal was begun by Pelley to replace Reality, which he had been forced to suspend in July 1939 during legal battles in North Carolina, in order to fill out that journal's unexpired subscriptions. It was originally addressed to Pelley's religious and to a lesser extent to his metaphysical interests but it became more shrill and political after the United States entered the Second World War as Pelley began to talk of "The Spiritual Significance of America's Armageddon" and the perfidy of Britain, the Roosevelt administration, and the Jews. Its Christianity (exemplified in Pelley's "Galilean Fellowship") centered on the Christ who had lived the same earth-shattering experience of separation of mind and body and the realization of the unreality of death that Pelley had had in 1928, and who freely traveled between this world and eternity to bring men his message--all infused, as Pelley said, with the Galilean's own"virulent anti-Semitism." 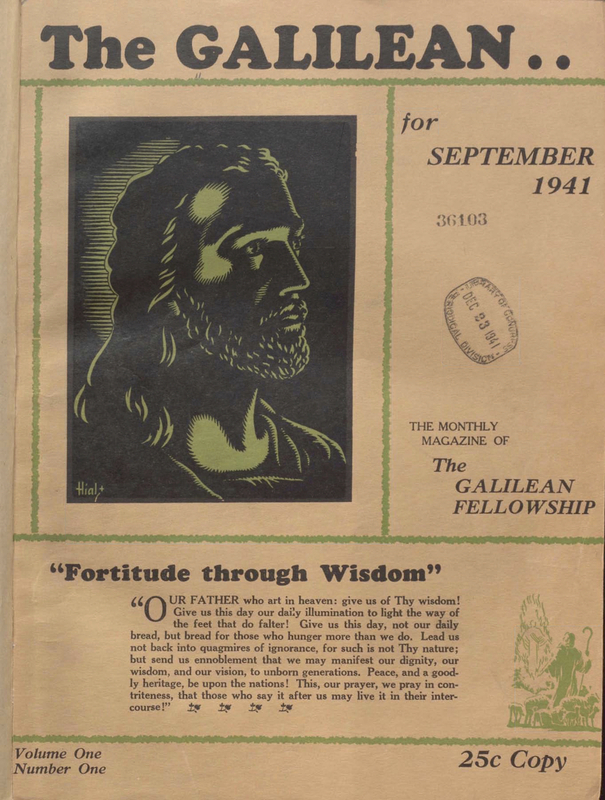 Each issue carried a "Golden Script," a lecture in sermon form on the original Galilean Doctrine that Jesus had taught and that Pelley said he received mysteriously between 1929 and 1935: "Strange revelations are of occurrence as this Aquarian Age comes in! The discovery of the mental gift of Clairvoyance by our great university psychologists, attests the possibility that the true Christian Message as propounded by the early Church Fathers may be recoverable from Mentors in octaves of Time and Space that Science is just beginning to penetrate. At any rate, from Somewhere have been recorded 257 preachments of such astounding wisdom and spiritual beauty as to offer a new Bible for our be deviled times. Their recording was begun under the most mystical auspices, in New York City in 1929. Not until 1935 was the last Script taken and their typing for publication begun." The centerpiece of this recovered Christianity was "Soulcraft," Pelley's preferred term for "psychics" and "spiritualism," both of which were inadequate to express the wonders of man's potential as taught by Christ: "When we talk about Soulcraft, therefore, and use the word in its legitimate sense, we are referring to the sentient spirit's facility in handling or displaying itself in pursuit of its thousand and one capabilities higher than the physical. Soulcraft, therefore, of which we are going to hear much in this Galilean instruction, is the blanket term describing what man's spirit is able to accomplish as an entity unto itself whether it be occupying the body in a specific span of mortality or performing in any one of its series of Light Bodies between three-dimensional visitations." Beekman's Pelley: A Life in Right-Wing Extremism (2005) says the journal had 1500 subscribers. Pelley stopped the journal in March when the government required him to submit the content for censorship before publishing, and he was arrested for sedition the following month. NYPL; LOC, microfilm; University of Washington; Jewish Theological Seminary.